The photographs above were taken under a flickering light source (at 120 Hz) with an exposure time of 1/15th of a second. In the top photograph, the ruler is stationary and no stroboscopic effects are seen. In the bottom photograph, multiple images are produced by each flicker cycle as the ruler moves across the scene. A common method of controlling the light output of light-emitting diode (LED) lighting systems is the use of pulse-width modulation, involving rapid switching on and off of an LED source with different duty cycles (defined as the percentage of time the LED is switched on). This technique can result in flicker. In addition, some LED lighting systems are designed to operate directly on alternating current (AC), which can also create flicker. There are two pathways to the visual perception of flicker. Flicker can be perceived directly if the frequency is low enough (below 100 Hz). Even at frequencies where flicker cannot be directly perceived, it can be perceived indirectly through stroboscopic effects, sometimes called phantom arrays or wagon-wheel effects. To assess the ability of individuals to perceive flicker directly and indirectly, and to understand the role of flicker characteristics on comfort, ASSIST and the LRC conducted laboratory studies under flickering patterns differing in frequency, modulation depth, duty cycle and waveform shape. Different correlated color temperatures (CCTs) were also compared. Findings from the first study were followed up with a second study to further examine the relationships between the variables involved with light source flicker. Photograph of test laboratory for ASSIST flicker study showing task luminaire and computer workstation. Consistent with published literature, flicker was directly visible (and rated as unacceptable) at frequencies of 60 Hz and lower, and was invisible (and acceptable) at frequencies of 100 Hz or higher, with 50% duty cycles and 100% modulation depths. Indirect perception of flicker through stroboscopic effects was strongest when waving one's hand underneath the luminaire, where multiple finger patterns were strongly evident to most people, even at 300 Hz. Modulation depth, duty cycle, waveform shape and CCT were all assessed at 120 Hz, the most common flicker frequency for AC LED lighting systems in North America. Only modulation depth showed reliable differences in the perception of stroboscopic effects (most people did not detect multiple finger patterns at 33% modulation depth), and duty cycle showed reliable differences in comfort (the 10% duty cycle was judged slightly less comfortable). There were no differences in flicker perception, either direct or indirect, for different waveform shapes, nor for different CCTs. The results demonstrate that when LED light sources flicker at frequencies of at least 100 Hz, direct perception of flicker is neither visible nor objectionable, but stroboscopic effects can be detected indirectly even at frequencies of 300 Hz, the highest studied by ASSIST. Mitigation of stroboscopic effects can be accomplished through decreasing modulation depth, by ensuring that light sources do not switch entirely off when they flicker. Avoiding low duty cycles near 10% may help prevent visual discomfort. Building on results from the first study, ASSIST and the LRC performed a follow-up study to systematically evaluate the tradeoff between frequency and modulation depth and to look more closely at the relationship between frequency and percent flicker. Under each condition, subjects were asked to wave a white, plastic rod back and forth underneath the luminaire and to report whether they could detect any flicker or stroboscopic effects, such as the presence of multiple or striated images of the rod. If subjects responded that they detected stroboscopic effects, they were then asked to rate the acceptability of the effect on a scale of –2 (very unacceptable) to +2 (very acceptable). Duty cycle (50% at 100% flicker; for the other flicker conditions, the minimum and maximum light output were each produced 50% of the time), waveform shape (rectangular) and CCT (4000 K) were held constant for all experimental conditions. The contour plot figures below show mean detection percentages (top) and mean acceptability ratings (bottom), both as a function of frequency and percent flicker. 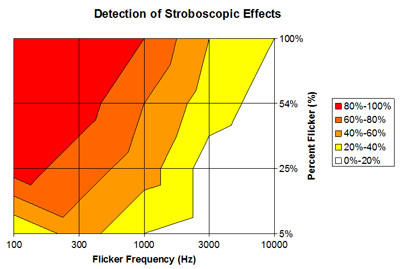 The results suggest that indirect perception of stroboscopic effects from flicker is systematically affected by both frequency and the amount of modulation of flicker. Although the trends for detection and acceptability are similar, they differ in one important way. 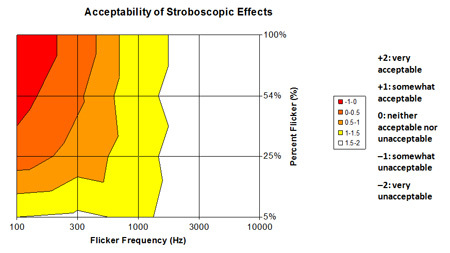 Once the flicker frequency was about 1000 Hz or higher, differences in modulation were unimportant for acceptability, but the amount of modulation had a large impact on detection of stroboscopic effects. In other words, even when many subjects were able to detect stroboscopic effects, most of them did not judge the flicker to be unacceptable. Such data might be especially helpful in the design of solid-state lighting systems, many of which can use pulse-width modulation and other modes of driving that produce flicker. ASSIST. 2014, Revised 2015. ASSIST recommends...Application Considerations Related to Stroboscopic Effects from Light Source Flicker. Volume 11, Issue 2. Lighting Research Center: Troy, N.Y. ASSIST. 2015. ASSIST recommends…Recommended metric for assessing the direct perception of light source flicker. Volume 11, Issue 3. Troy, N.Y.: Lighting Research Center. ASSIST. 2017. ASSIST recommends...Evaluating Light Source Flicker for Stroboscopic Effects and General Acceptability. Volume 11, Issue 4. Troy, N.Y.: Lighting Research Center. Bullough, J. D., N. P. Skinner and K. Sweater Hickcox. 2013. Visual task performance and perceptions of lighting quality under flickering illumination. Journal of Light and Visual Environment 37(4): 189–193. Tan, J. and N. Narendran. An approach to reduce AC LED flicker. Journal of Light and Visual Environment 38, advance publication online August 26, 2014; doi: IEIJ130000531.